apply the assessed knowledge and skills in familiar contexts. critically and apply the assessed knowledge and skills in varied contexts, both familiar and unfamiliar. The EPISD students scored far below the YISD and SISD students. Is it the students? Is it the teachers? Is it the way teaching the subject is administered? This entry was posted on Wednesday, March 14th, 2018 at 5:00 AM and is filed under El Paso Independent School District. You can follow any responses to this entry through the RSS 2.0 feed. You can leave a response, or trackback from your own site. This really hurts my soul for our EPISD kids. I was fortunate enough to have an amazing Algebra teacher in middle school before he left the profession, thank you Mr. Bustillos!!! Wow! Those scores are enough to make you want to move. Do not send your children to EPISD! Blame the “initiatives” created by Juan Cabrera. This is the result of removing textbooks, academic coaches, giving laptops to all students without a way of monitoring what they are doing, and taking away prep time from teachers. Expect these numbers to drop even more as current middle schoolers approach high school. These students have been given MacBooks and they spend most of their day playing on them. Way to go, Tim Holt. EPISD’s demise is the result of people like you. None of that data actually means anything… “APPROACHES Grade Level?” And the definition of this term is that the student is “Expected” to pass the next grade level in subject!? A subjective number indicating a subjective expectation. The numbers listed are artificially high and are due entirely to subjective factors. And, trust me… The tests are set so that all a student needs to pass them is to accomplish a small fraction of the problems to get the coveted “Passing” label. None of this actually tests a student’s ability or “mastery” of the subject material. This whole analysis is just more money earned for the massive testing companies (at the expense of instructional time). And, it is the continuance of the GREAT LIE of the current upper admin of EPISD: “We care about the education of your children”. It SHOULD be causing a horrible problem for EPISD. Because, here is just another example of how their New Age Reformation of Education is just failing miserably. But, EPISD has now made a fine art form of using the severe apathy of the people within their district boundy lines. EPISD doesn’t care about your children because they no longer HAVE to care about your children. No one will hold their feet to the fire anymore. The progressive political narrative just isn’t acting as a fit substitute for the actual teaching of young human beings. IT IS NOT WORKING, EPISD! It is alarming to say the least. The EPISD has traditionally been a source of many of our students that went on to medical, dental, and veterinary schools. Math is the basis for physics, chemistry, pharmacology, and other similar disciplines which are crucial for students in the medical field. These shocking stats indicate that something is seriously wrong in the math teaching process in the EPISD. As has already been alluded to, throwing more money at a problem, or increasing the pay of the superintendent will not solve this illness. Ask Tim Holt. He knows everything there is to know about education. Plus he has all the excuses. “Approaches Grade Level” is “newspeak” for flunked by thiiiiiiis much. The tests themselves are fair tests of the math level expected of the students in the various HS grades. Saw one last week where there were 80 questions and a student only had to get 30 right to pass. Must be the new math . Ripper1951. Yes, that is EXACTLY what it is. The “problem” is MONEY. TAXPAYERS of El Taxo just need to be TAXED MORE, throw MORE money in the EPISD pile and give Cabrera a few more $100,000 pay raises. MORE tax INCREASES. After all, “It’s for the CHILDREN”.. I believe the approaches column includes all students who at least got that level. The masters column includes also those students under the approaches category, but were able to get to the masters level. I am not 100% sure, though. The table is missing another category: Meets. The above chart is a little confusing. 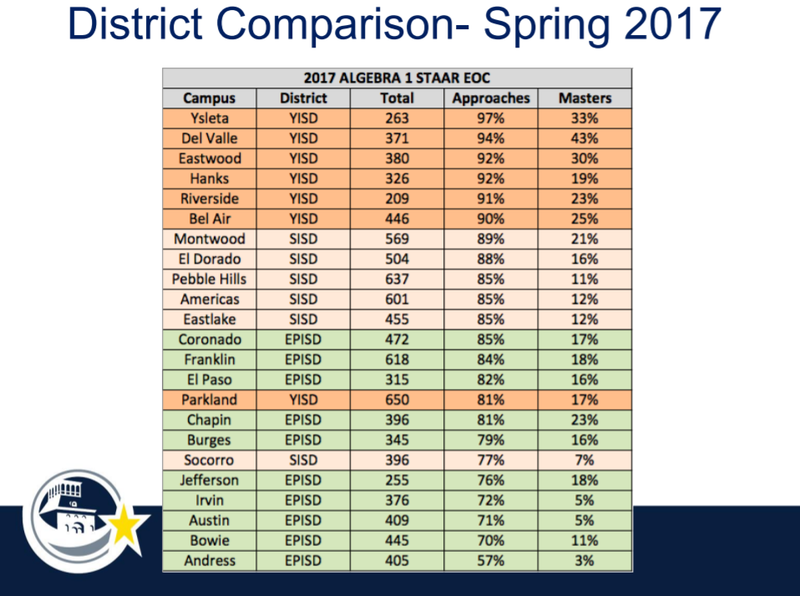 It shows by comparison how the EPISD ranks when compared against other districts. But what you need to understand is that the column (Approaches) tell you is that (Austin HS) has 71% approaching which means that 29% failed the test. The 71% includes all other students including Approaches, Meets, and Masters. You need the Meets and Masters to figure out how many are in the real approaches column. On this test it takes 20 correct out of 54 to be counted as approaches or 37% correct. So all students that get between a 20 and 54 are counted as approaching which is ridiculous. But it keeps the parents off the backs of TEA and districts.